ALOE VERA has healing and regenerative properties. It is moisturizing and anti-inflammatory.Achillea millefolium is used in cosmetics for its decongestive and healing properties. 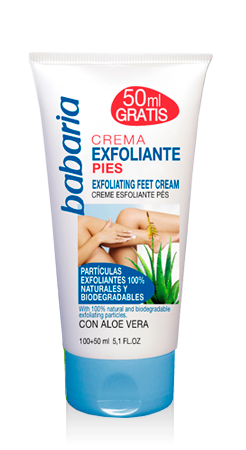 After application it brings a sense of relief and well being to tired legs and feet. ACTIVE INGREDIENTS: Aloe Vera, talcum and a deodorizing agent. PROPERTIES: Especially designed and formulated to keep foot moisture under control. Cares for the skin thanks to the moisturizing properties of Aloe Vera. Dries rapidly so you can put socks and shoes on immediately. ACTIVE INGREDIENTS: Aloe Vera (20% pure Aloe Vera), 20% Urea and Shea butter. PROPERTIES: Urea is an extremely hydrating active ingredient. Repairs dry, rough skin in 7 days. Urea increases the hydration of the corneal layer which, in turn, diminishes scaly skin and strengthens its resistance to irritants. Moisturizing creams for cosmetic use contain concentrations of urea of less than 5%. For medical use, creams contain concentrations of between 20% and 40%. Formula designed to combat unpleasant odours with its active ingredients while caring for and moisturizing the feet thanks to the properties of Aloe Vera. Dries rapidly without leaving an oily film or other residue on the skin. 24 hours odour-free.Controls excessive perspiration and prevents unpleasant odours.Its aloe vera content moisturises and pampers your feet. PROPERTIES:Regular application helps to minimise hard, rough skin. It also contains 10% aloe vera for additional moisture.